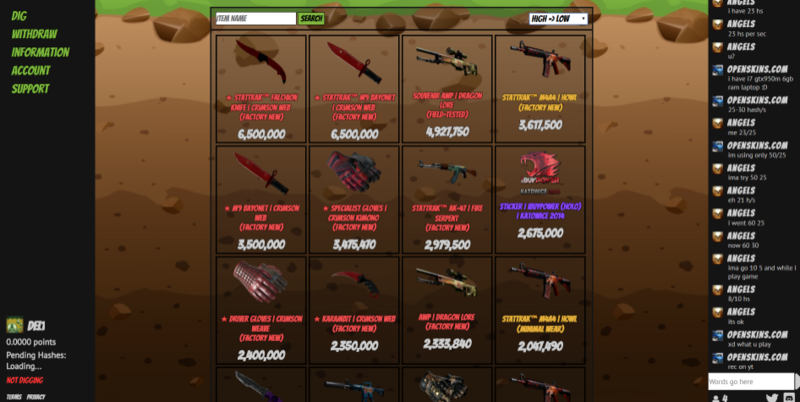 CSGODig - A brand new way to get free CS:GO skins. On CSGODig, you use your CPU’s processing power to “dig” for hashes which can be exchanged for skins in the Marketplace. The amount of hashes you dig is entirely dependent on how fast your CPU is. The CPU % and Thread count sliders can be adjusted to use more/less of your CPU. If you want to work on other things while you dig, consider setting the sliders lower so it does not impact other operations on your computer. Meanwhile, if you want get as many hashes as possible, set the sliders to a decently high number. If you have any questions or issues, please send a support ticket and we would be happy to help!